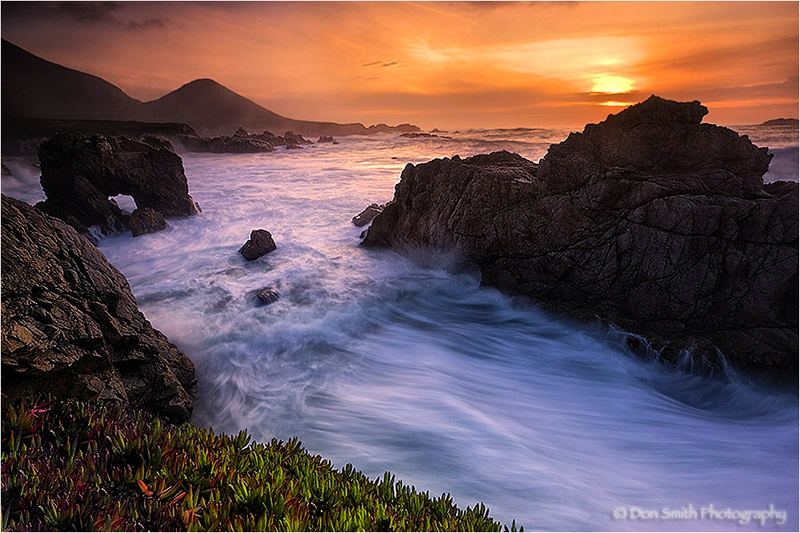 Don Smith (California, United States) on 16 June 2011 in Landscape & Rural. It's time form me to speak out about California's proposal to close 70 of its 278 State Parks by next July 2012. If you would like to learn more about this impending debacle and what you can do to help, please read Help Save Garrapata State Park (and 69 other parks) From Closing. Very clever use of the low shutter speed. I like the wide angle fx and colors !!! I like details in the foreground !!! I like this picture !!! @DowsherVision: And I like all your nice comments Dowsher - thanks for writing. The foreground and the depth are great in this picture. @Aubélia: I appreciate your comments but I ran this image to illustrate what we here in California will be denied should this park be closed - it's truly a tragedy. Grandiose, c'est tout simplement sublime, du très grand art. @David Bénézech: Thank you David. @James Guillory Photography: I fear that people are just looking at the image and ignoring what the message of this blog was intended - to bring attention to the closure of this park. Thanks for recognizing that James. I hear you are coming back out - when will you be here? Outstanding tone and such power in the flowing water. @Ralph Jones: Thanks Ralph - I was really hoping this would elicit some comments from California photographers who would be outraged at the closing of this magnificent park - hopefully they will respond. wow, what for a composition! this photo is really overfload with mood! @klausZ: I hope the message gets through - for me that is what is important with this post Klaus. Hi Don..Even though we don't live there right now, Barbara and I have always considered ourselvs as Californians, both of us having been raised and educated there...and spending most of our married life there, taking the kids to all sorts of State Parks to camp and have fun. So yes, we have definitely been watching this issue and I signed on to the State Park org a few weeks ago to try and do whatever I can as support...I will check this out tonight from home - can't open it here - But this is really a shame and we all must try to to whatever we can to pursuade State government to not go through with these closures...I will certainly continue in whatever way I can with this. Parks such as Garrapata in your lovely image here, will suffer greatly, but the real sufferers will be the families, kids, and all visitors who will be deprived of the educational, natural, and spiritual benefits provided by Rangers, Visitor Centers, Guided walks, hikes and the just the peace that the State Parks afford the soul..Thank you for posting this and Barbara and I are definitely with you! @Denny Jump Photo: We need to get you two back to California Denny. I could see you raising some hell in Sacramento. My heart is breaking over this...I am angry and discouraged all at once! I have signed the petition, sent letters, and would happily go to the State Capital to protest in person! We literally raised our kids camping and hiking these parks, and I honestly believe that they are the the wonderful adults they are today because of those experiences. So I add my own pleas to all who see this beautiful image....We are in danger of losing these places that people come from all over the world to see-- Even if you are not a California resident, we will ALL lose if these parks are closed! Thanks for posting this Don. @Tracy: You are welcome Tracy - I knew you would support this. I fear that by reading the responses from most people that no one is reading what this is about - they are simply responding to the image. A masterpiece, fantastic work Don, congratulations..!!! @Stefan: I appreciate it Stefan but I believe you are missing the point here. @guillaume: ...that may never happen again with the closure of this magnificent park. A wonderful image Don! This is a very worthy cause and one of the most beautiful stretches of coastline in the world! @Scott F. Schilling: I hope you find the time to sign the petition this weekend Scott. I also know that you and Mike have some incredible images of Garrapata also - hopefully you guys can champion this cause also. i do hope that the National Parks will not be closed down and will continue to operate! on another note this is fantastic photo with a very special quality of light! the exposure is balanced superbly between all elements, there is a great flow and balance to the scenery! @DarkElf: It's actually State Parks that are in trouble here in California Dark Elf but thanks for taking the time as always to write. We have less than a year to find alternate funding but hopefully something will be done. Just recently I "stumbled" this photo of yours and admired it for a very long time (simply had it on my screen and stared at it for quite some time)...I think, it is one of my most favorites of your coastal shots. I hate to say "the most favorite" because for some reason, each time I use this expression, I end up being wrong, so I'll say just "one of my most favorites". What I think that this images makes me like it so much, are the colors (besides the mood). I so much LOVE the white balance, the uncontrasted blacks (if there is such a word, the spelling feature complains that it doesn't exist :) ), and ...the reds...ah..that shade of red in the upper left corner till about middle of the image, it's just ...amazing...no idea whatelse to say...I just love that shade of color..
@Maria Draper: I know you used to live near Pt. Lobos and Garrapata Maria and I know it would break your heart to see this closed. I appreciate all of your superlatives regarding the image but hopefully the image is not masking the reason I ran it, which is to bring attention to the fact that images such as this may not be available to anyone once this park shuts down. I would hope you would use some of your spectacular images to help spread the message. Don, Thanks for taking the time to shed light on this issue...California state parks are valuable resource that are utilized by all ... Not just locals, but visitors from all over the world. @Mike: Hope to see you post an image and some encouragement on your site Mike. Even if Garrapata (and others) stay open, trails will not be maintained. As you know, the trail to this location leads directly through a poison oak grove. If no on maintains that trail, this site becomes inaccessible. @Gina: I appreciate you comments Gina, but unfortunately that is not the point of this post. so beautiful colors and light... lovely place indeed! @skarlet: ...and likely to be closed forever. Now that is truly beautiful. @Tim: I appreciate your thoughts Tim but the real purpose of sharing this image was to make a point that this park (and 69 others) will not be available to future generations. It seems as if most are just looking and responding to the image. Although I appreciate everyone's kind words, it seems my narrative, for the most part, has been ignored. although mesmerized by your art, i plead guilty in missing the point (and your title)! it seems that in TX, too, the parks and wildlife dept. is getting short shrift (as well as in education!). hopefully, the winds of killing off our parks will shift. maybe the answers are a change in the way parks are administered or managed. unfortunately, short sighted elected officials are not keeping the interests and concerns of future generations in mind right now. everybody's broke. i hear CA is in the same boat. whatever the case, the TPWD must weather this storm and adapt because texans are going to suffer. it appears californians are going to, too. @Tim: I appreciate you writing back Tim, I know many folks here on Aminus3 missed it. I'm hoping that private corporations will step up and adopt these parks so they will not close - only time will tell. Such a lovely image, Don. The ebb and flow of the water and its patterns are mesmerizing. Well, if the government runs it, it's likely to get screwed up and bound up. We need nature and its beauty to be maintained for health, balance, and our states' tourism. Perhaps some private groups or corporations would step up. So sad... All around the world for money questions, deep human attacks against Nature...Where do we go so...? I'm crossing fingers with you too!